Febreze Air™ Refresher Linen & Sky. Eliminates tough lingering odors. 8.8 oz (250 g). 100% Natural propellant. With OdorClear™. Febreze odor elimination technology. CFC-Free: Federal regulations prohibit the use of CFCs in aerosol products. Patents: www.pg.com/patents. Questions? 1-800-308-EASY (3279). 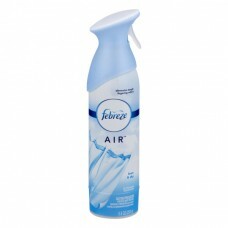 Visit: www.febreze.com, www.pg.com. ©2016 P&G.